We applaud the Blaine County School District for updating their website with current information about the new math program. Last week, we really had to dig on the BCSD website to find information regarding the math adoption process even though the textbooks were approved back in June, 2011 (see section XII.b.). According to the U.S. Department of Education, no valid math study showing the effectiveness of Investigations meet evidence standards. Investigations’ reports do not indicate to what extent schools supplemented the curriculum. Investigations, Second Edition has only been in schools for 3 years. Does 3 years of data constitute a track record? Are we joining an experiment in progress? You Decide. One document we did not see on the district’s Math Adoption process page was Assumptions Regarding Selection of Textbook Series, Math Task Force Meeting: January 4, 2011. The Pro’s and Con’s of the textbooks are an interesting read. Sample sizes are sometimes small: Talawanda, OH Investigations chart. Apples to oranges? Sometimes several grades data are used, others time only a single varying grade. Scale of graphs visually show growth, but actual percents decrease (Rapid City Area School District). If we are misreading this data presentation, please let us know in your comment below! Can anyone make sense of the data represented in this report: Rapid City, SD Report? On page 3 under the 3rd grade data, the graph shows 49% visually represented as larger than 68%??? The narrative references 7 years of results, but the data only shows 3 years. Can someone please explain these apparent discrepancies to us? Although TERC Investigations promotes this district as “proven effective.” The reality is TERC Investigations will no longer be used at Prince William County Public Schools beginning in 2012. Until the new textbooks can be adopted and to ensure adequate coverage of math standards, the school district will be providing teachers with a supplemental pacing guide. This guide provides a timeline for teachers to follow to ensure that all of the Standards of Learning (SOL) have been taught prior to the Virginia SOL Test. Teachers are also provided supplemental lessons from various other sources to support objectives that are not covered fully in Investigations. 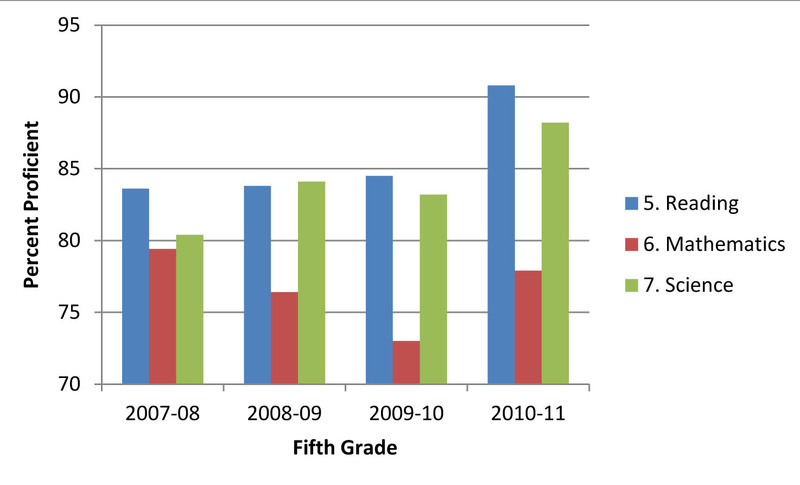 In the report on the BCSD website, the Investigations study focused on 4th grade data. But when you look the 5th grade data, from the year before Investigations 2nd edition was implemented to now, the numbers paint a very different picture. We have included data from reading and science to demonstrate the growth in these subjects in contrast to the lack of growth in mathematics. It looks as if the Rapid City graph is following students through their grades. Children that started in third grade in 2003 are depicted in yellow. You can follow their progress through 5th grade by looking at the yellow bar graph. The children that started 3rd grade in 2004 are in pink and so on. The 7th year is referring to the grade the 2003 students would be in at the end of the study. I hope they (Investigations “TERC”) are better at presenting math than statistical reports.